The wool coat at the left of the photo above is the one that went with my father’s “pinks and greens.” It weighs about fifteen pounds. I imagine he wore it after he was commissioned and sent to Germany for his first post in Garmisch. He used to tell about having to walk ahead of a car in a snow storm to make sure that his buddy didn’t drive off a mountain. They had been skiing and were in danger of being late for parade or something. The coat may have accompanied him to Korea soon after. I can’t imagine he’d of needed it whilst at LSU. Even with the lining taken out, it’s warm. I wore this coat through college, when it got me across campus in all sorts of foul weather. It also took me through lots of bars. The epaulettes were useful for tucking my black beret and gloves under. The high collar supplied a certain anonymity. Not that I wasn’t getting looks in a coat like this. It’s missing the throat latch. The last I remember seeing it was the night we drove to Hampton (?) to a bar in a waterfront mall that served Guinness on draught. Somewhere there’s a photo of me on the beach, completely buttoned up. I’m the only one who didn’t look like he was freezing. Burberry patented gabardine in the mid to late 1800’s and held the rights to the tightly woven, wind and water resistent fabric until 1917. 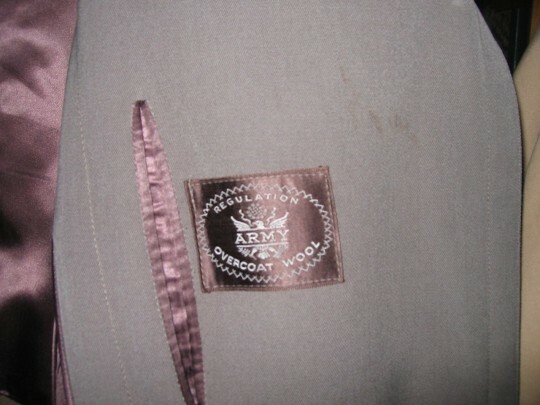 They first made a raincoat in wool gabardine for those who served in the Boer War. It wasn’t long until that raincoat came to the attention of The War Ministry and some half a million coats were issued to the men who fought WWI. 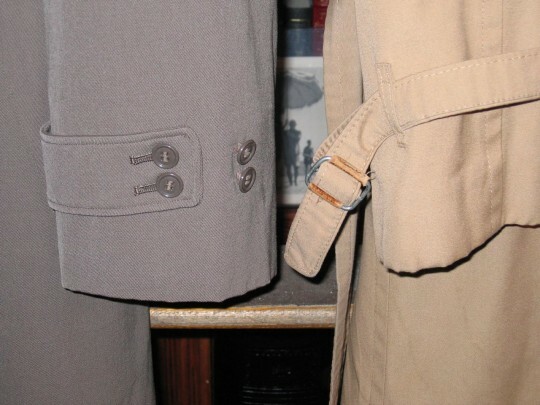 The trench coat was born. Form follows function in the classic trench coat. Epaulettes held Sam Browne belts and shoulder straps in place as well as displaying rank. The D-rings on the belt were for slinging extra pouches, maybe grenades — but I wouldn’t want to take the chance on dislodging a pin by accident. The storm latch closed the throat up to protect the wearer during extreme weather. Cinches at the wrist tightened for the same reason. The storm flap at the right shoulder added a measure of waterproofing as did the the short rain cape across the shoulders. The coat is a bit shorter to allow for freedom of movement whislt going over the top, or riding whatever is at hand. 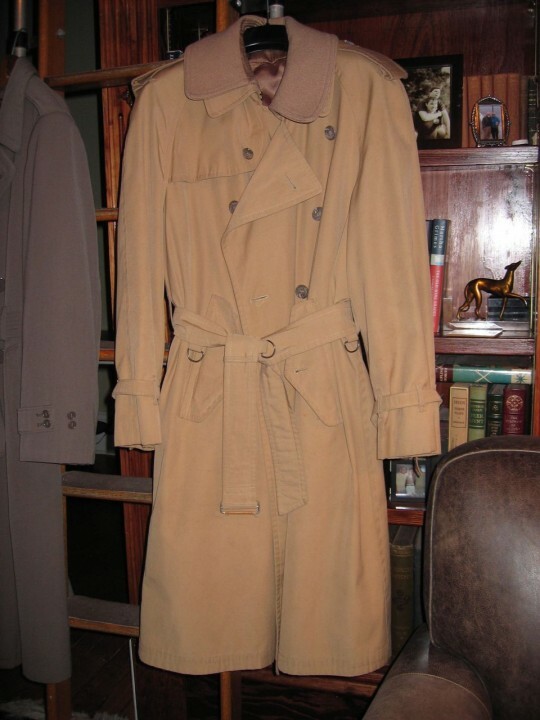 This one was my father’s trench coat as interpreted in cotton for Britches of Georgetowne. He wore it for most of the 1980’s, until he died in ’87. 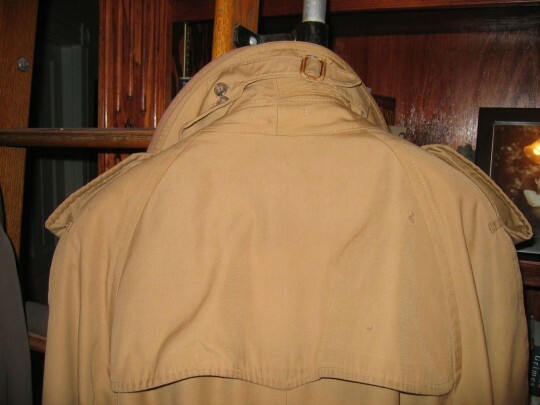 It was his daily commuter coat when he retired and returned to work for DOD at the Pentagon. This version retains a lot of the original design, right down to the d-rings, which were never pressed into service. It was also considered stylish to tie the belt rather than thread the strap through the buckle. 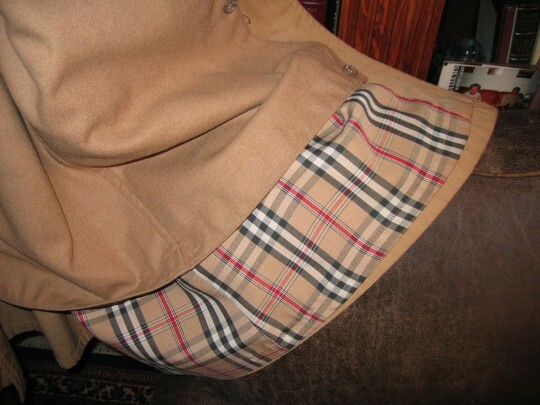 I could never determine whether or not the lining is Burberry’s produced under license. It is mostly hidden under the wool and acetate button-in lining. Both coats are a little worse for wear, but they are still warm, functional and vaguely stylish, even if their cuts are out of fashion. Sort of like the men and women of the Armed Forces. Support the troops. Support the mission. They’d rather be warm, dry and at home now too. Thank a veteran. 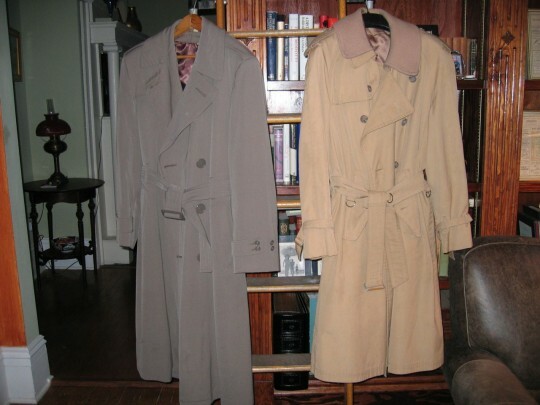 This entry was posted in Elegantology and tagged Boer War, Britches of Georgetowne, Burberry, LSU, Pinks and Greens, Sam Browne Belt, Trench Coat, Veteran's Day, WWI. Bookmark the permalink. This is a really great post. So very well put. Great post. These are lovely coats and you are so lucky to have such interesting stories and fond memories that go with them! Great reminders and memories of your father, very interesting. What wonderful garments, and yes, I can see that they would be heavy to wear! A lot of wool gab there–plus lining, trim, hardware, etc. Isn’t it great that clothes were made to last forever? Many years ago, I worked at a lovely ladies specialty store, and they had “all weather” coats made in Poland. I could barely lift the hangar off the rack, they were so heavy! Very neat! I have my father’s denim navy jacket, double breasted, short, buttons with anchors and ‘U.S. Navy’ embossed on them (which my father said they had to sew on themselves). One of the many life skills a young man learned in the military–that and shining shoes and making beds . . .
Mr. E., thank you for remembering our veterans today with this nice post. My heart has been sad since the terrorist attack at Ft. Hood last week. We displayed our flag at our home today in remembrance. P.S. Should have capitalized Navy. That was a charming post – loved learning about the origins of the extra bits on trench coats – I know where to stash my grenades now. Lovely moving words about the vets. Well said. Thank you ELS, that’s part of the fun for me, the trivia. Tape up the handles on the pineapples first though — one tree branch…. Paula, I’ve got to get my flag fixed.. hated not having it out yesterday, even in the deluge of Ida’s passing. Karena and Nick, thanks. Nostalgia is tricky, but I think I got most of it right. Mr. Lane, just trying to keep up with you. I’d hate to let down the side. I forgot to mention that I wore my rain coat with the huge red poppies on it. It was the perfect coat for the day, both the weather and the occasion. I don’t think the Army has ever come close to the aviator pink and green of WWII. I remember an interview with a reporter on a DDay Anniversary a few years back. He was standing on the beach in the aftermath with a pilot in dress pink and greens. When asked why he was in dress uniform the pilot replied he had a date with a lady that night in London. No kidding Tintin. My Dad used to lament the passing of the uniform. I still have his in a box. Not in the best shape. The hat is good looking too. Even without a 50 mission crush as he was Infantry. As I write, I’m within reach of his swagger sticks too. I love the quality and style of military and uniform clothing. I have a vintage cop jacket, without insignia, that I wear with jeans and Chelsea boots. 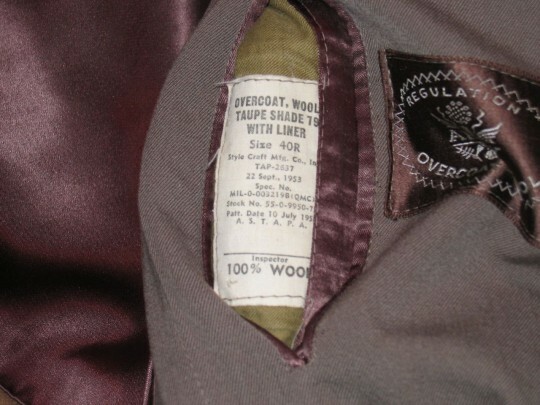 The classic looks, proportions, and most durable fabrics are liberating in that one never has to be careful with them. You can forget you are wearing them, and that is definitely an aspect of being elegant. After examining the heaviness and quality of such garments, even the best designer clothing seems cheap and unsubstantial. Amazing how nary a season passes without designers mining military and uniform references. I say stick with the originals. Why dilute a classic? They’re perfect in their original forms. Great discussion for Veteran’s Day, or Remembrance Day as we call it in Canada. God bless all the men and women who sacrifice so much for our freedom. “You can forget you are wearing them, and that is definitely an aspect of being elegant. ” Very well put SwF. And after donning an original pea coat, you couldn’t possibly feel protected in the designer versions. They practically stand up on their own. Recognize that this is a late reply to your post, but here is a very cool website from Burberry that does a brilliant job at understanding why people buy luxury goods in a recession. Enjoy! Newms, I’ve seen the site. The Sartorialist shot for it. It bugs me a little though, in its navigability. But I’m middle-aged. It is nicely photographed though and gave me an idea or two.